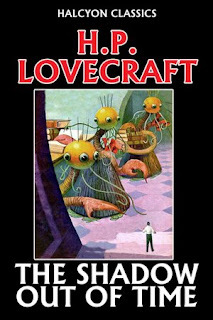 I admit, I haven't read many of Lovecraft's works. But what I have read, I love. I have read quite a few stories from the Cthulu Mythos, The Case of Charles Dexter Ward and now this fascinating little novella about time travel and mind transference and spiritual possession and such. H. P. Lovecraft was an American authors, known for his tales of madness and gory and has influenced some of my favourite writers; not to mention, was himself influenced by some of the greatest horror/weird fiction writers. Those of you who are familiar with or like Lovecraftian horror, should definitely give this one a try. The Shadow of out Time, published in 1936, is a combination of horror, thriller and science fiction. The story takes place (sort of) in the early 1900s, when a man named Nathaniel Wingate Peaslee happens to temporarily switch bodies with a member of the Great Race of Yith; a weird species that is able to travel through time and space. And it is Nathaniel who tell us the story! What I like about Lovecraft, is how he dives right into the crazy, gory part of a story; without a build up or even a vague idea as to how grotesque things might become. It is shocking, but it is also fascinating. It makes me realize how unnecessary the build up is. The narrator tells us what has happened at the start, even though it would normally be the suspense in a story. And then the story of how he got there, that works as the suspense. It is terribly intriguing. It is a short, quick-paced novella, with wonderful writing and an engaging plot; so it certainly makes a nice, quick read. Do try it, it's worth it. It was the perfect book for me to read as a part of the 24 Hour Readathon, at any rate!